As part of our Pay-it-Forward initiative, Blackbox Finance offer a LIMITED amount of FREE “Lunch & Learn” seminars where we educate your staff on the basics of protecting their finances and enhancing their future. There is a an alarming amount of people losing their credit score which restricts them from getting finance for years. An additional benefit is if we teach your staff to manage their money better they become more focused at work and at a recent seminar the business owner commented “that may just save me getting nagged about a payrise so often”. It’s is a 1hr session as outlined below. The seminars don’t have to be at lunch you can have them before or after work if preferred. Most companies we work with use this as part of their employer of choice / wellness programs. There is NO SELLING in these sessions at all, it’s all education. Gives them tips and tools to regain control of their financial future. There is no selling of product or services during these sessions, they are 100% education. What we get out of it? Positions us as the experts to a group of new people. Ability to help anyone who identifies they could benefit from more discussions with either presenter. Need More Convincing – How About Some Facts? 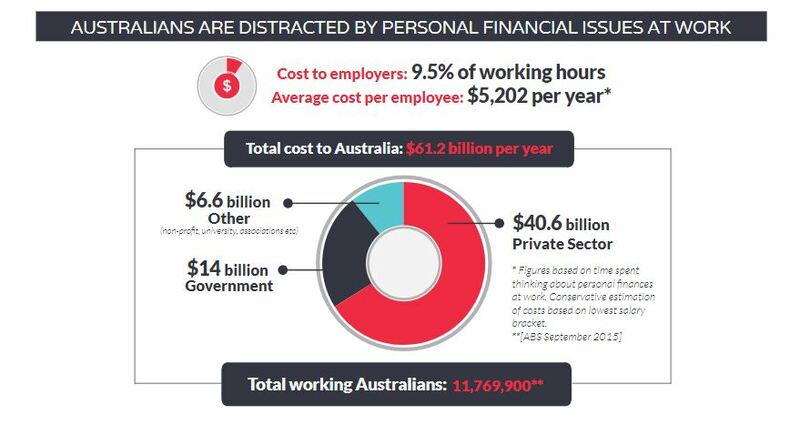 Images courtesy of “The financial fitness of working Australians” report. Contact us if you would like a copy of the whole report.